Click For More Information About Building a New Home on a Lot in Lewisburg Estates! Located on the west side of Mandeville in St. Tammany Parish, Lewisburg Estates is a community where you will find a mixture of old and new homes. Those looking for old or new Southern style will find the perfect home in this unique community. Nestled among large yards with lush green landscaping it is hard to imagine that these quaint Southern homes are located just minutes from New Orleans. 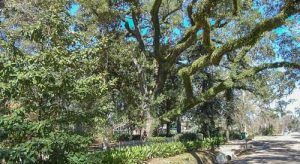 Known for the beautiful old oak trees, residents of the community have created a Live Oak Society. The world’s largest live oak sits among the community and is known to locals as the Seven Sisters Oak. Residents Enjoy Easy Access to Lake Pontchartrain & Embrace the Boating Lifestyle. Historic Lewisburg was established in 1834 and resides on the land that formely inhabited settlers from the early 1760s. The community saw its growth when the railroad arrived in 1906. It is now home to Southern waterfront stately homes that sit along Lake Pontchartrain on Copal Street. Right outside of Lewisburg you will find a couple of great restaurants. Mande’s Restaurant has a great breakfast and lunch menu and has a great casual atmosphere. For the more refined atmosphere there is Pat Gallagher’s 527 Restaurant that won the OpenTable Diner’s Choice. The Village Shopping Center just a few miles away and offers a diverse selection of shopping from stores such as Chico’s to the Fresh Market.